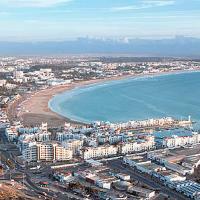 Research conducted by On the Beach, the UK’s leading beach holiday specialist has revealed Agadir, Morocco’s premier beach holiday resort, located on the shore of the Atlantic Ocean at the foot of the stunning Atlas Mountains, as the best value holiday destination for sun-seeking Brits this year. The research, which compared the average cost of a one-week holiday across the most popular summer and winter sun destinations amongst British holidays, found Agadir to offer the lowest prices with the sun-kissed island of Malta, with its stunning UNESCO-listed capital of Valletta, named the second best value holiday spot. The ever-popular Portuguese region of the Algarve grabbed third place, with the Greek islands of Kefalonia and Corfu named the fourth and fifth best value holiday destinations for 2018. Research conducted by On the Beach also revealed that for families looking for a great value holiday, Agadir is one again the best option, closely followed by the Costa Brava region of Spain. The research, which focused on holidays for families of five (two adults and three children) revealed the Costa Dorada as the third cheapest option for British families with the Greek island of Corfu grabbing fourth place. According to research, the Algarve (Portugal) is the fifth cheapest option for British families. On the Beach also compared the cost of all-inclusive holidays for 2018 and found the Moroccan resort of Agadir offers the very cheapest holidays with Spain’s Costa Brava named the second cheapest destination for all-inclusive holidays. The research revealed the Egyptian Red Sea resort of Marsa Alam, which is becoming an increasingly popular resort for Brits, as the third cheapest holiday destination for all-inclusive holidays, with the Turkish resorts of Bodrum and Dalaman grabbing fourth and fifth spot respectively. On the Beach also compared the cost of holidays this year to last and found holidays to Marrakech offer the biggest savings, with the average price of a holiday down a whopping 24% on last year. According to research, holidays to many of the most popular Greek islands are cheaper this year with Zante (-10%), Kefalonia (-8%), Kos (-5%) and Corfu (-3%) all offering better value.